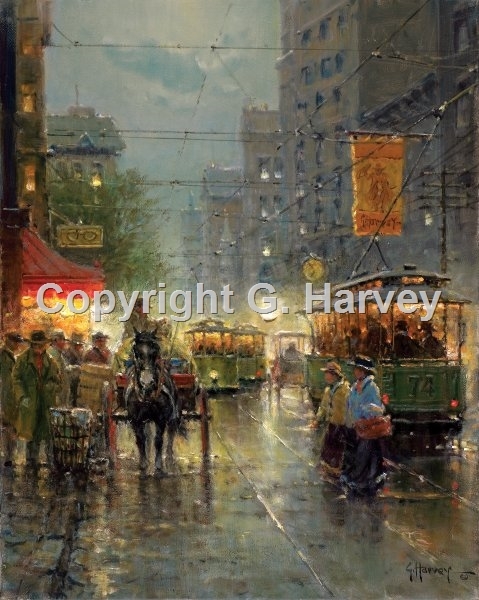 One of G. Harvey's favorite subjects is Dallas. The turn-of-the-century brought dramatic change to the city. Cowboys on horseback shared the streets with trolleys and horse-drawn carriages, and eventually the early automobiles joined in. It was an exciting time - an era infused with the enthusiasm of entreprenuers - the creators of today's powerful West.